Work has completed for Guvnor's support of Limited Entry decision tables and will be first available in 5.4.0.Beta1 (or now, if you are able to work with the source from github). This facility, coupled with use of either Java or Guvnor enumerations and the ability to create an expanded-form decision table makes the whole decision table authoring process much, much easier in Guvnor than ever before. 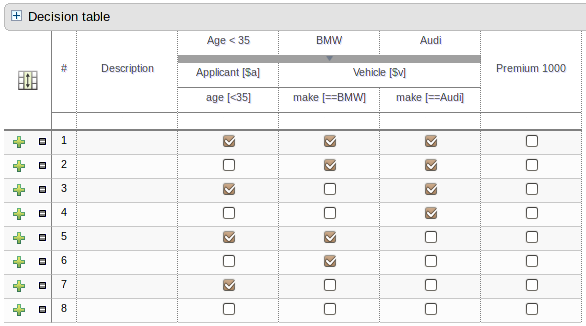 You can choose to construct either a Limited or Extended entry decision table when selecting to create a new web-based, or guided, decision table. 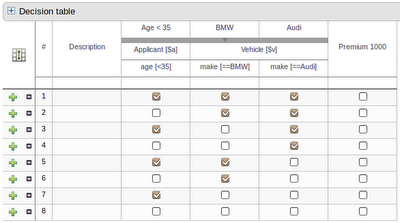 Limited Entry column definitions now support the capture of all constraint or action parameters and the table itself becomes a simple choice of selecting the appropriate combinations. Of course, when electing to create an expanded decision table using the Wizard all possible constraint combinations, or a sub-set if the user so chooses, are provided and populated in the grid as a starting point. These recent enhancements really represent a huge step forward.